This time we will showcase how Vestel White Appliances managed to save on hardware expenses and increase the overall efficiency of the product line of the refrigerator plant by just introducing virtual serial ports created with the help of Virtual Serial Port Driver Pro. Vestel White Appliances is the biggest exporting company in Turkey. It has 6 production plants (refrigerator, washing machine, dishwasher, oven, dryer, air condition), and they sell more than 80% of their products all over the world. Alex Taylor: What challenges made you search for this kind of software? Özgür Ersöz: On the production line, we are using several barcode scanners for collecting production information (i.e. serial number). The barcode readers send the data through RS-232 serial port. The data is used for the SAP application (ERP software) On the other hand, we need to use the same data for the different application (i.e. quality check software) then we should have another serial port (COM) because of this conflict. Alternatively, we may use an extra barcode reader. Of course, the latter means an increase in expenses and more complexity. Thus, we have decided to create virtual serial ports. Therefore, we could use the same data for all applications by dedicated serial ports. Alex Taylor: How did you get to know about our software? Özgür Ersöz: By the means of Google search. Alex Taylor: Did you try any similar product(s) before coming across ours? Özgür Ersöz: No, we have only used your software. Alex Taylor: Why did you choose our product over competitors? What made it stand out for you? Özgür Ersöz: Your company profile (wide product range, client references, website contents, etc.) proves that we found the right place. Alex Taylor: How did you benefit from using our solution? 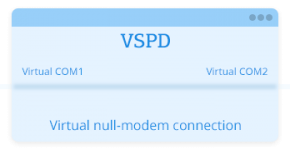 Özgür Ersöz: By creating COM port bundles with the Virtual Serial Port Driver Pro, we can use the same barcode scanner for different applications. Thus, we are saving the hardware expenses and can apply the solution that we plan in an easier way. Alex Taylor: Are you happy with our software at this point? Why or why not? Özgür Ersöz: We are absolutely happy. It is user-friendly and easily applicable. Alex Taylor: Do you feel our prices are: high – about right – low? Özgür Ersöz: When we think of the benefits by using the Eltima solution, the price seems to be quite reasonable. Alex Taylor: Has our customer support system met your needs? Özgür Ersöz: Yes, especially when we ask for the usage and purchase possibilities. We’d like to thank Özgür Ersöz who works as a mechanical engineer at Vestel White Appliances and has occupied various positions (production management, process engineering, production planning, quality department, etc) of refrigerator production during the last 20 years, for finding the time to take part in our questionnaire.